The most interesting thing about Alfonso Cuaron’s Gravity – at least to someone who was born before the start of space exploration in the late ’50s – is the realization that, although the entire film takes place in space, it’s no longer science fiction. Certainly, it contains numerous genre elements and the central situation is one which was a minor staple of written SF way back then (for instance, there are echoes of Tom Godwin’s short story The Cold Equations, published in 1954, the year I was born); but for decades now, actual people have been doing the kinds of things the characters in this movie are doing as it opens – walking in space, fixing satellites in orbit, and so on. In this sense, reality has caught up with and passed genre. The least interesting thing about Gravity, however, is – well, the story it tells, which is as trite and cliched as any piece of genre hackwork from that same pre-space-race era. There’s no denying that Cuaron and his team have done an impressive technical job evoking what it must be like to float in the void above Earth’s atmosphere, although this kind of thing has been seen for years now in IMAX shows about the shuttle and the International Space Station. What Cuaron does with this technical achievement however is less impressive. 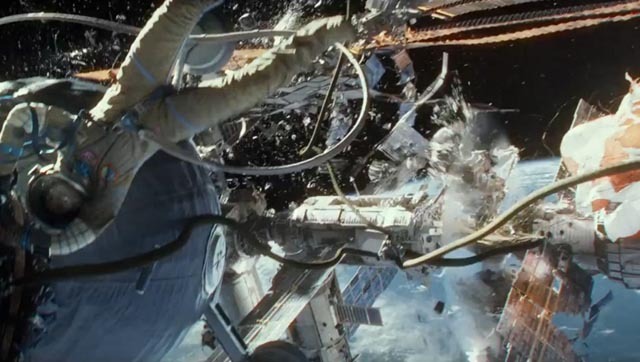 We get a story which quite quickly focuses on the single lonely figure of Ryan Stone (Sandra Bullock) cast adrift when her shuttle is destroyed by satellite debris and forced to use every resource available to her to make it safely back to Earth. The movie piles on the obstacles in an escalating arc of desperation and by halfway through, the illusion of reality has been replaced by the melodramatic excesses of an old silent serial. Stone is subjected to everything short of being tied to the railroad tracks as the express train races towards her. (And naturally we eventually get to the required moment when the female astronaut strips down to her underwear.) All plausibility is shredded the way the shuttle was at the start, and by the time she begins randomly hitting buttons in an old Chinese capsule and just happens to fly the thing back to Earth for a safe landing in water, it’s hard to know just what point Cuaron has been trying to make. This is as silly a rollercoaster ride as The Pirates of the Caribbean movies, and in the end about as convincing as the corny old George Pal-produced Conquest of Space (Byron Haskin, 1955). Despite the supposed technological advances in movie-making, Gravity fails to create as convincing an experience of space as Kubrick’s 2001: A Space Odyssey did in 1968. And one lesson Cuaron definitely didn’t learn from Kubrick was the awesome power of silence. There is no sound in space, but instead of using that to his story’s advantage, Cuaron buries the film under a tediously overblown music score which constantly distracts from the often impressive visuals. So paradoxically, although the experience of space is no longer a matter of pure imagination but rather a reality, Cuaron’s film feels more like a piece of fiction, a movie, than does Kubrick and Clark’s fantasy. Certainly the story of Oblivion is not particularly original, but the world Kosinski creates has depth and resonance and a genuine sense of awe. It seems apparent by now that no matter what M. Night Shyamalan does, it’ll be greeted with derision and contempt. Why he in particular should have been singled out as a whipping boy, I can’t say – there are directors with far less talent who don’t get this kind of abuse. Needless to say, the reviews for After Earth weren’t very good. And yet this is a beautifully designed science fiction adventure which might have been adapted from one of Robert A. Heinlein’s juvenile novels. A coming of age story in which an adolescent has to overcome many dangers in order to save not only his own life but also that of his injured father, it plays out in lush landscapes populated by hostile wildlife and technological risks. Like his last film, the fantasy The Last Airbender, this is a kids’ film made without condescension and with a commitment to conjure up a complete world. These films are the modern equivalent of Harryhausen’s Jason and the Argonauts and William Cameron Menzies’ Invaders From Mars. It’s a pity that this kind of imaginative filmmaking no longer seems to be appreciated. David Twohy’s third movie about Vin Diesel’s second signature character (after Dom in the Fast & Furious franchise) backs off from the large-scale, PG adventure of the second movie and returns to the basics of the first, Pitch Black (2000). There’s nothing subtle about these movies, but they’re made with a commitment to B-movie thrills stripped of any unnecessary embellishments. These are stories of superhuman survival in hostile environments – particularly planets where vicious creatures emerge at night. Riddick has an advantage because his eyes have been surgically altered, giving him acute night vision. But his real advantage is that he’s a deadly psychopath, willing and able to kill anything or anyone that gets in his way. Twohy manages to make Riddick the hero by surrounding him with people who are even worse than he is (the same trick used on the TV series Dexter and, recently, in Ryuhei Kitamura’s No One Lives); Riddick is the hero by default because, unlike those he encounters (people and monsters), he has integrity and lives by a code to which he strictly adheres, making him despite his psychotic tendencies an honourable man. Neill Blomkamp’s follow-up to his big hit District 9 shares with the earlier film its design sense and a visual style which emphasizes a gritty, lived-in “realism” (though the shaky-cam technique is so excessive here that it quickly becomes a distracting annoyance). Unfortunately, what it doesn’t share with its predecessor is a well-written script. 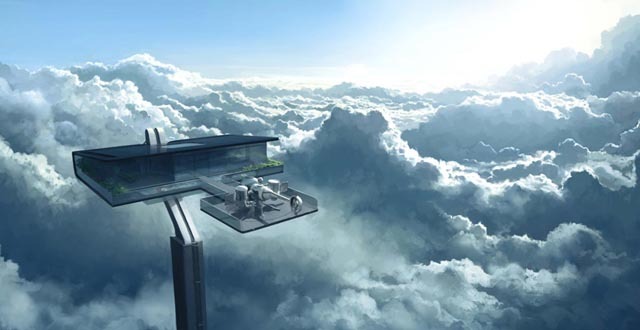 Although larger in scale, with a bigger budget and bigger stars, Elysium comes across as a vague, half-baked attempt to comment on the catastrophic divide between rich and poor, with the latter trapped on a shattered, polluted Earth while the former bask in luxury in a vast orbital city (rather obviously influenced by Larry Niven’s Ringworld, though on a miniature scale). Max (Matt Damon) is one of the poor, a worker who’s dreamed since childhood of making it to the paradise in the sky; when he’s exposed to a lethal dose of radiation, he joins a group of criminals who promise to help illegals get up to Elysium for much-needed medical care. In the implausibly uplifting third act, Max sacrifices himself to break down the barriers between haves and have-nots. But the narrative never engages the way it did in District 9, and the cartoonish villains (Jodie Foster as Elysium’s chief of security and Sharlto Copley, star of District 9, as the unmotivatedly evil mercenary Kruger) seem more irritating than threatening. Coming so soon after The Expendables and its better sequel, this futuristic prison-break movie starring Sylvester Stallone and Arnold Schwartzenegger is disappointing. Stallone plays Ray Breslin, a security expert who tests prisons by finding ways to break out of them. He’s hired by someone who seems to be from the government to test a new black site prison for the “worst of the worst”, but immediately finds himself genuinely imprisoned. The high tech facility seems completely implausible – if these irredeemable prisoners really are being locked away out of sight for the rest of their lives, wouldn’t it be simpler and cheaper simply to kill them? Even though it eventually turns out that the rationale for the prison is a bit more nefarious (the corporation which runs it is using it as a kind of extortion factory, squeezing its high profile inmates to get access to secrets and hidden bank accounts), the concept remains stubbornly mundane. Mikael Hafstrom’s direction is uninspired, the action unimaginative, and the two stars just walk through their roles without any of the humour and self-awareness that made the Expendables movies such satisfying throwbacks to the heyday of ’80s action. This entry was posted in Commentary, Review and tagged Directors, Science Fiction. Bookmark the permalink. Yes, the 7th age beckons… though your shrunk shanks still belong in the 6th. Unfortunately my shanks are not that shrunk!